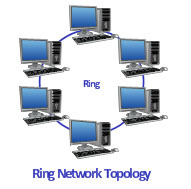 In Ring Topology all the computers are connected in in a closed loop and form a ring architecture. Each Computer is connected it other neighbor computer as shown in figure and last one is connected with first one and every system have two neighbor systems. Each computer device is act as a repeater. It works on token system where data is transmitted by passing a token around the network. when a token is free a computer acquires it and attached data with a destination address and send it over the network. When Token is received by destination system, data adoption take place and again token become free for other system in network. Transmission take Place in both directions. Every system act as a repeater . Data transfer take place in sequential manner . Network expansion is not costly. Easy to troubleshoot due to beaconing which is its special internal feature. Data packets travels with a good speed or we can say fast transmission. Transmitting network is not affected by high traffic or by adding more nodes or systems as only the system have token only can transmit data . Failure of one computer or system disturbs the hole network. In ring topology communication delay is directly proportional to number of nodes available in network because data has to transfer for each node. So with the increase of node transmission time increase and with the decrease of node communication time decreases. Require more cable than bus topology. Without free token system can’t transmit.